Modern lifestyles have come at a cost for many. The medical field is at the center of these changes that is occurring in the lifestyles of people. Many new diseases are being diagnosed each year; most of them categorized as the lifestyle diseases. The good news is that the medical experts are up to the challenge fighting each disease at a time. With advancement in technology in the medical field, the medical teams have been able to come with cures for most diseases. Technology in the field is being used to educate the public on information concerning major diseases, their symptoms, causes and treatment available. The enlarged thyroid gland also known as thyroiditis is a condition in which the thyroid gland swells up causing pain and other symptoms to the affected. The thyroid gland is one of the vital organs in the human body that produces hormones mainly involved in metabolism. The thyroid gland manufactures two hormones that include thyroxine and triiodothyronine. These two hormones control metabolism by maintaining the rate at which the body utilizes fats and carbohydrates. In the long run, they regulate the body temperature and also protein production in the body. There are various causes of an enlarged thyroid gland. One of the major causes of this condition is iodine insufficiency in the body. Iodine that is naturally found in sea water is responsible in for the formation of thyroid hormones. In most countries, iodine is added to common as part of the diet hence ensuring sufficiency of the element. Graves’ disease is another cause of an enlarged thyroid gland. This disease occurs when the thyroid gland produces excess thyroid hormones. Production of the excess hormones results from internal processes that cause the immune system to produce antibodies that attack the thyroid gland. As a result, the thyroid gland responds by producing excess thyroid hormones and the process the gland swells up due to excess stimulation. Multi-nodular goiter also causes thyroid gland enlargement. 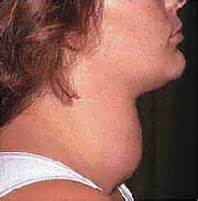 Multi-nodular goiter is a condition whereby multiple liquid filled lumps form on both sides of the thyroid gland. These swellings lead to the enlargement of the thyroid gland. Pregnancy is also another condition that may result in thyroid gland enlargement. Hormones produced during pregnancy such as the human chorionic gonadotropin may cause an abnormality in the thyroid gland hence causing it to swell. Symptoms of thyroiditis vary from one person to another. However, there are universal symptoms that manifest in most patients. They include constipation, dry skin, hair loss, irritability weakness and weight loss. Advanced symptoms of the condition include heavy sweating, high blood pressure, shaky hands, increased heart rate, very high fevers and restlessness. Early diagnosis of an enlarged thyroid gland is very essential so as to ensure cheap and quick treatment. Advanced conditions may lead to complicated surgeries being performed on the patient that may have a tragic end. Ensure that you regularly checked for the disease by qualified medical personnel for prevention or early diagnosis. Healthy leaving is also crucial to ensuring that your body is well functioning and that all your body parts are healthy.